During our tour of Galilee in northern Israel, we visited the ancient city of Capernaum. The New Testament town figured prominently in Jesus’ public ministry. The ruins of the city remain today on the northern shores of the Sea of Galilee. I took a “Walk through the Bible” course years ago, and the instructor taught us the geographical mnemonic: “Capernaum caps the Galilean Sea.” Now you’ll never forget its location! Capernaum served as a base of operations for Jesus’ ministry in Galilee. After John the Baptist’s death, Matthew 4:12 states: “Leaving Nazareth, Jesus went and lived in Capernaum.” On the nearby shores of the Sea of Galilee, Jesus called Peter, Andrew, James, and John to follow him. The Gospels describe Jesus visiting the home of Simon and Andrew in Capernaum. Jesus healed Simon’s mother-in-law of a fever, and then she served them a meal. (Insert your favorite mother-in-law joke HERE.) This marked Jesus first recorded healing miracle in the second Gospel. 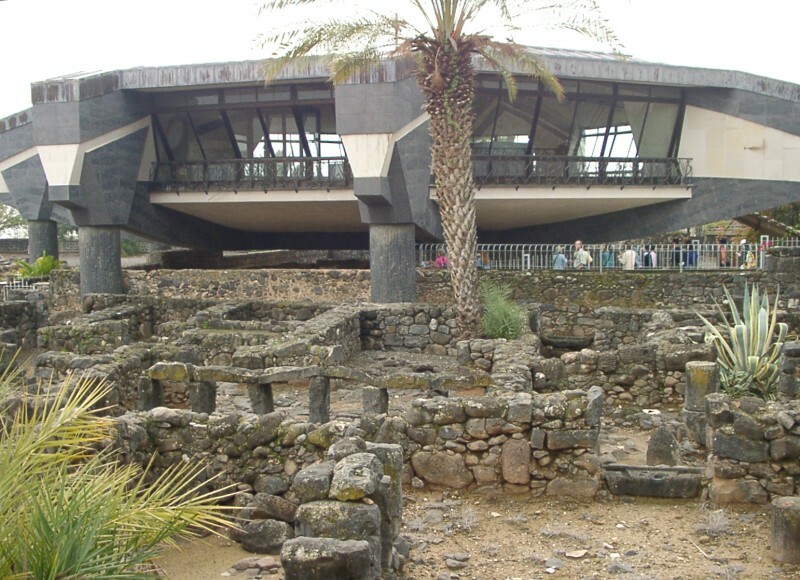 Some archaeologists believe they have located the site of Simon Peter’s home in Capernaum. They unearthed the ruins of a simple home that was later transformed into a public building—perhaps a church. In the fifth century, the Byzantines built an octagonal church on top of the spot. Today a modern Catholic church sits suspended above the archaeological site. In the center, a glass bottom allows worshippers to see the traditional location of Simon Peter’s home. I’m not an architectural expert, but the contemporary, octagon-sided church resembles an alien spaceship perched atop the ancient ruins. 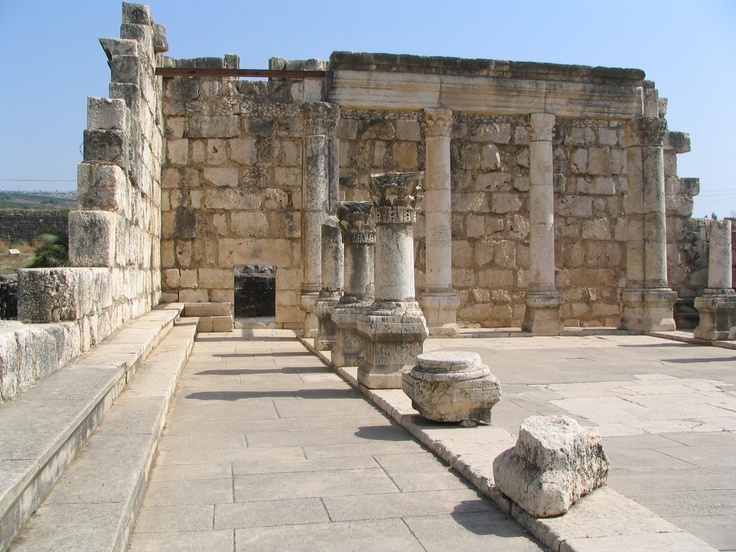 Jesus also taught in the Capernaum synagogue. According to Luke’s Gospel, a Roman centurion actually built the Jewish place of worship. Here Jesus exorcised a demon, healed a paralytic lowered through the roof by his friends, and proclaimed the coming kingdom of God. Over the past two centuries, archaeologists have unearthed one of the world’s oldest synagogues in Capernaum. The relatively intact structure appears to have been built in the 4th or 5th century—centuries after Jesus’ life. However, the preserved structure gives visitors a sense of how the original structure might have appeared. Under the foundation of the building, scholars have found another foundation made of basalt. Some think this formed the floor of the synagogue that Jesus frequented. Certainly a high probability exists that the two synagogues occupied the same site. During our tour, a fellow pastor began asking tour members, “When did the light come on for you? What has been the most significant moment of the trip?” People responded with a variety of answers. The history major in me certainly found Capernaum intellectually interesting. Based on the stone outlines, I could envision a small, thriving village on the shores of the Galilean Sea. I found the “proof” of the authenticity of Simon Peter’s home less than convincing, but Christians have worshipped there for centuries. The place possesses a holiness all its own based on countless saints gathering at this site. Our associate pastor, Andrew Erwin, experienced Capernaum in a much different way. God’s light blazed for him in that city of ruins. The ancient synagogue spoke to the depths of his soul, forming a “thin place” between heaven and earth. Andrew recognized that he stood on holy ground, imagining Jesus preaching, teaching, and healing in this very place. The opportunity to literally walk where Jesus had walked filled him with wonder and awe. When Andrew shared this spiritual moment with me later, tears filled his eyes. I envied his experience. I found myself asking, “How did I miss that?” In the midst of a hurried, harried day of touring, I didn’t slow down enough to truly reflect on the moment. In his ministry, Jesus repeatedly told the crowds: “For those who have eyes to see, let them see. For those who have ears to hear, let them hear.” Ironically, one of the places Jesus spoke these words was on the lakeside adjacent to Capernaum. You don’t have to travel to the Holy Land to experience the presence of the Lord. However, you can also miss the Holy Spirit’s touch wherever you might be. God moments abound for those with attentive minds and sensitive spirits. Andrew had eyes to see in Capernaum while I turned a blind eye to the moment. So I pray for the Spirit’s nudge—maybe even a shove—to get my attention the next time. For those with eyes to . . . well, you know. This entry was posted in Holy Land Pilgrimage 2015, Uncategorized by Bill Burch. Bookmark the permalink. This is truly a moment of spiritual reflection after last weeks journey. We need to ponder on the “Were you there?” Thanks for sharing. While I did not have the experience that Andrew had, this was one of my favorite places that we visited. It was a great experience to walk and think about the thriving village with people everywhere. I also liked the location where Jesus called his disciples to become “fishers of men.” Both locations were moving experiences.